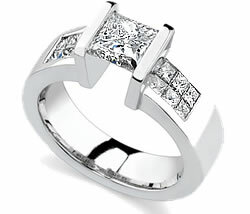 All diamond rings are special, but there's something particularly appealing about invisible set diamond rings. If you're unaware of these jewels of the jeweler's art, you're missing out -- invisible set diamond rings are among the more attractive pieces of jewelry on the market today. Whatever you elect to use one for -- wedding ring, engagement ring, or just personal adornment -- an invisible set diamond ring will be sure to draw admiring glances and plenty of questions. The term "invisible set diamond ring" means what it implies: it's a special form of diamond ring in which the diamonds are set so cunningly that no metal is visible -- no prongs, no beads, no channels. This doesn't mean that the stone is glued on (can you say "tacky? "), only that the setting itself isn't obvious. Invisible set diamond rings use a variation of the pavé setting that requires a special kind of stone as well as a special setting. Therefore, invisible set diamond rings always have multiple square-cut stones, since this is required in order for the invisible setting to work. In most invisible set diamond rings, the stones are arranged in a metal border, frame, or track, in such a way that none of the binding metal shows, at least from the top. Look at a typical invisible set diamond ring, and you'll see that the stones are set flush with one another. If invisible set diamond rings are done well, they present a fine display of gemstone uniformity. Because this type of setting requires square stones, princess-cut diamonds are most often used in invisible set diamond rings. Needless to say, invisible settings are the most difficult of settings, and only a small percentage of jewelers can manage them. They're also time-consuming and expensive. That makes invisible set diamond rings somewhat more rare than other diamond rings, which means, in most cases, that invisible set diamond rings are also more expensive than ordinary multi-stone rings, pavé or otherwise. Of course, considering their rarity, these rings will also tend to retain their value even better than other diamond rings. If you've got your heart set on an invisible set diamond ring, keep a few things in mind as you shop. First of all, tension set rings are not the same as invisible set rings; they are, in fact, something altogether different. Tension sets use only the tension or "spring" of the ring metal to hold the stone in place, in order to let light pass through it unobstructed; while this results in a brilliant stone, it makes for a ring that looks quite different from a invisible set diamond ring. Then there are the imitators. Beware of rings with illusion cut stones. An illusion cut stone is a rectangular stone with fine groves cut into its face, in order to make it look like it's really several stones. While it's true that you won't be able to see any of the setting between the stones -- since there's no setting to see -- this doesn't make it a real invisible set diamond ring. Accept no substitutes, especially if they're asking invisible set prices!